Example pages from the collection. 'Gymnopedie' and 'All that you are' being around grade 3/4. Clockwork chuck around grade 5/6. 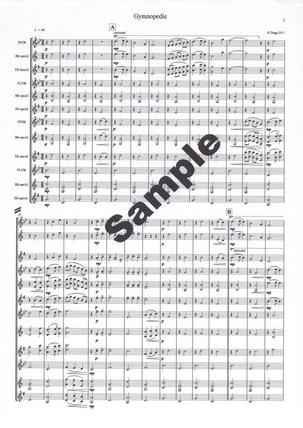 Click on a sample page to open and print. 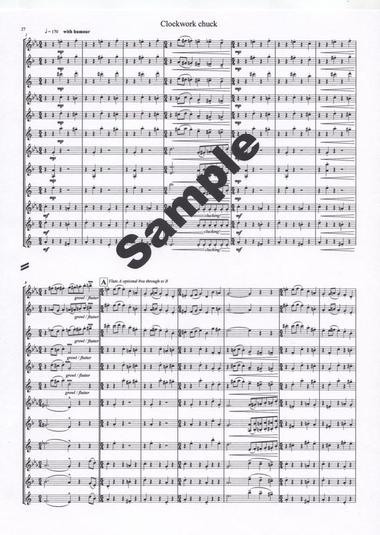 Have you ever been frustrated that there is very limited repertoire available for mixed ensembles? We think we may have filled that gap with our exciting new collection of original pieces. 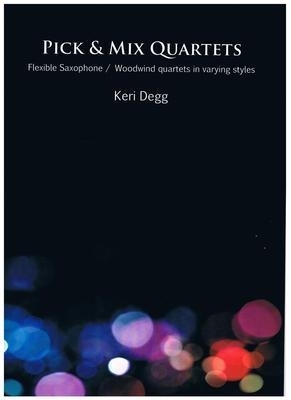 Although written with a standard SATB saxophone quartet in mind, Each part (A,B,C,D) has multiple parts; one for Bb, Eb and C woodwind. 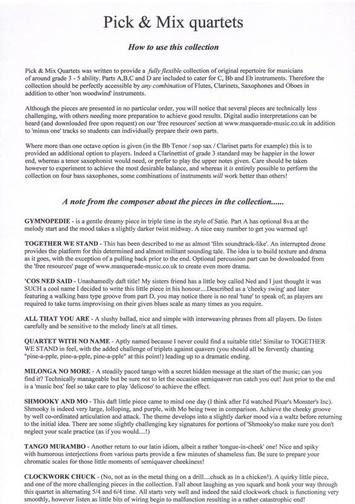 The pieces vary in standard from around grade 3 (Gymnopedie, together we stand, All that you are) through to the more challenging Shmooky and Mo, Tango murambo and the hilarious Clockwork chuck for an ensemble achieving roughly grade 5/6 level. In effect, Pick & Mix quartets grows with your group! Gymnopedie (a dreamy piece in 3 time in the style of Satie). Together we stand (a militant building 'film like' piece). Quartet with no name (a solemn tale with building feeling). Shmooky and Mo (a daft funky number!). Milonga no more (slow tango style with a hidden message in the first 3 bars...).Tango Murambo (a tongue in cheek tango with humorous interjections from the lower end players). Clockwork chuck (as in chicken). (a comical piece in alternating time signatures; 5/4 6/4 etc which ends in an almighty catastrophic end to the said ' clockwork chuck'!). 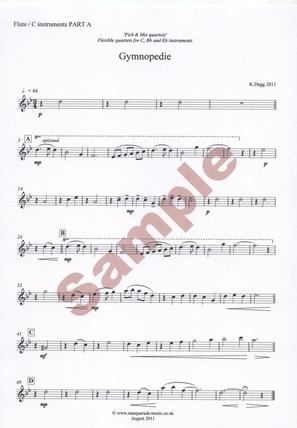 In addition, we are providing free Minus one digital tracks upon request via our free resources page so students can 'play along with the band' at home in preparation. Simply enter your email address and the Captcha code (to let us know you're not a robot ;) and we'll send you the mp3 tracks. Don't forget that we also offer a PDF email delivery option on this item; great for overseas customers are just those liking a bargain!